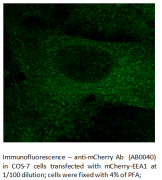 We introduce our new partner SICGEN with a free sample promotion for the detection of GFP and mCherry! Green Fluorescent Protein (GFP) is the prototype of a family of fluorescent proteins. Due to its property of exhibiting bright green fluorescence when exposed to blue or UV light, GFP has emerged as a powerful research tool. In the last years, many different fluorescent proteins have been developed, among them mCherry, an engineered derivate of GFP which emits red fluorescence. 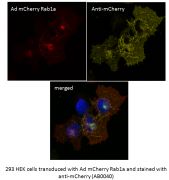 Use the top selling antibodies from our valued partner company Sicgen against GFP and mCherry, to visualize these protein tags in assays in which you cannot take advantage of the auto-ﬂuorescence of GFP and mCherry! For a limited time only, we offer a 20 µl free sample* size in Europe, so you can test the performance of these antibodies for yourself! These antibodies are produced in goat and both are suitable for Immunohistochemistry, Immunocytochemistry and Western blotting. Acris Antibodies distributes Sicgen products worldwide. All antibodies are in stock in US and in Germany. 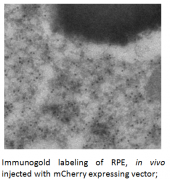 (*) Free samples available as long as stocks last; For European customers only; One vial/customer and antibody; Does not apply for bulk orders.